My name is Caroline. I stay in the East End of Glasgow with my two teenage sons. We have lived in poverty for most of their lives. It hasn’t been easy bringing them up as young children as a single parent. I became an expert on budgeting. I started college to make a better live for us to find a way out of poverty. I had to give up after 5 months of studying due to a sudden and debilitating illness. I became involved with The Poverty Truth Commission in Glasgow in 2014. It has changed my life. The Poverty Truth Commission is leading the way in bringing together those living in poverty with decision makers. More of them have been created across Scotland and England. This tells you how vital it is having people like me. We are the experts living with the impact of poverty every day working alongside decision and policy makers to create change for the better. 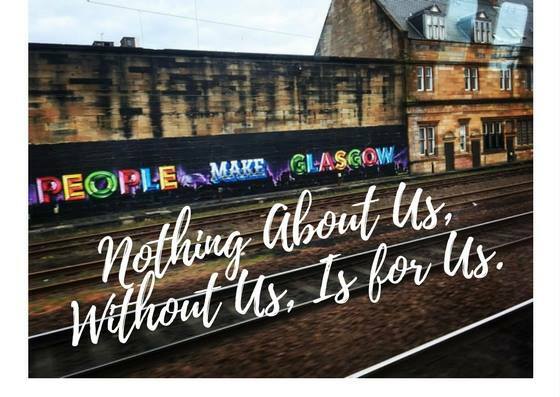 Through them I am now involved in another organisation called The Poverty and Inequality Commission which was created by the Scottish government in 2017. We give independent advice to Scottish ministers on child poverty across Scotland. It works well having us all with our area of expertise, mines happens to be poverty and knowing the issues that are affecting people on the ground. One in four children in Scotland are living in poverty. It’s more than a statistic, it’s a real life situation that many families find themselves in living with every day. Child poverty is a passion of mine. I visit a school in the East End of Glasgow to speak about poverty and inequality in school. One big issue is around holiday hunger and families find themselves having to find money for lunches where before the child would have had a free school meal. It’s no coincidence that there is a spike in the use of food banks at this time. I have through the summer school holiday visited areas across Scotland to speak with parents who are finding school holidays a challenging time. 13 weeks out of the year the schools are off, that is a quarter of the year where free school meals are not provided and where families struggle not only with costs of food and activities but child care which is expensive if you do not have family or friends to support you with this. I am wanting to raise awareness of the many difficult challenging aspects of child poverty and through speaking to affected parents and my role in the Poverty and Inequality Commission we hope to help reduce the number of children living in poverty. Scotland is lucky to have a government that is serious about wanting to do this. I wish it could extend to the UK government to have all children across the country poverty free. It’s my passion and commitment for every young person to be the best they can be and to be equals. They should have the same opportunities without the restrictions of poverty affecting them. I want children to have the right to the same opportunities without isolations or barriers. Powerful family accounts presented by @AnnaGupta2 from collaborative work with @ATDFourthWorld. Continued need for social workers to recognise the fear & shame that families can experience in their encounters with social work.